Is the relationship between Gibbs and Abby on NCIS inappropriate? Showrunner Gary Glasberg responds to that question and others about the hit CBS series. NCIS has already had one big controversy surrounding its eleventh season when star Cote de Pablo announced her decision to leave the show after eight years. But at last week’s Television Critics Association press event, showrunner Gary Glasberg fielded questions about more than just Ziva’s departure from the team. 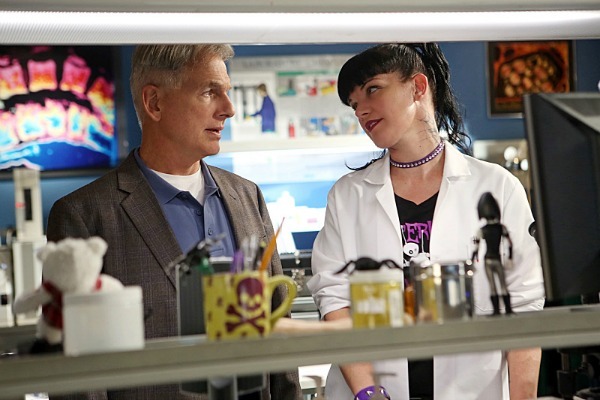 Surprisingly, one member of the press wanted an explanation about the relationship between Gibbs (Mark Harmon) and Abby (Pauley Perrette) on the show. Fans of the show know that after tragically losing his wife and daughter at the hands of a criminal, Gibbs struggled to let anyone into his heart. Slowly, but surely, his team became his family and it’s obvious that Abby became Gibbs’ adoptive daughter. While Tony (Michael Weatherly) and McGee (Sean Murray) might get mostly growled at and smacked on the head (which Abby once told Tony made him feel wanted), Abby gets deliveries of her favorite caffeinated beverage and pecks on the cheek. Are those pecks indicative of a relationship that should send the two to the HR department? Glasberg said no. Another subject brought up was the recent episode that left McGee’s new love interest paralyzed. When asked about the storyline, Glasberg said, “I’m really proud of that decision.” According to Glasberg, putting Delilah into that situation came about from an intent to show an individual taking charge of her life. “We’re very excited by what that character will face in a wheelchair,” Glasberg said, adding that all of that will be “exciting fodder” for a lot more story lines to come. “I hope we do it justice,” he added. As for the controversy that came earlier in the season, Glasberg called it “a challenge.” Once he got word about de Pablo’s exit, he immediately got to work on finding just the right replacement. What do you think of the relationship between Gibbs and Abby on NCIS?